Easily the most anticipated festival in the city just in terms of size, in 2019, the Montreal Jazz Festival runs June 27 - July 6, 2019, and with it comes hundreds of free concerts lining downtown's Place des Festivals and surrounding streets and squares from noon till night over the course of ten days. Add to that 200 more indoor gigs featuring a mix of living legends, up-and-comers, and sought-after recording artists in their prime. All in all, crowds exceeding two million walk through the fest's outdoor hub every year. Melody Gardot is a highly acclaimed singer-pianist-guitarist. She’s returning to the Jazz Festival after the release of an album last February, Live in Europe. Melody Gardot performs at the Montreal Jazz Festival on July 6, 2019,​ at 7 p.m., at the Salle Wilfrid-Pelletier, Place des Arts. Buy tickets. The Montreal Jazz Festival is certainly no stranger to Portland, Oregon's multilingual "little orchestra" Pink Martini, a regularly featured musical act at the fest known for flashing back to the sounds and sensibilities of the '40s and '50s. The big band's latest nostalgic, jazzy-esque whimsies round out its recently-released ninth studio album "Je Dis Oui!" -that's French for "I Say Yes! "- sung in 8 different languages, from Armenian to Farsi. 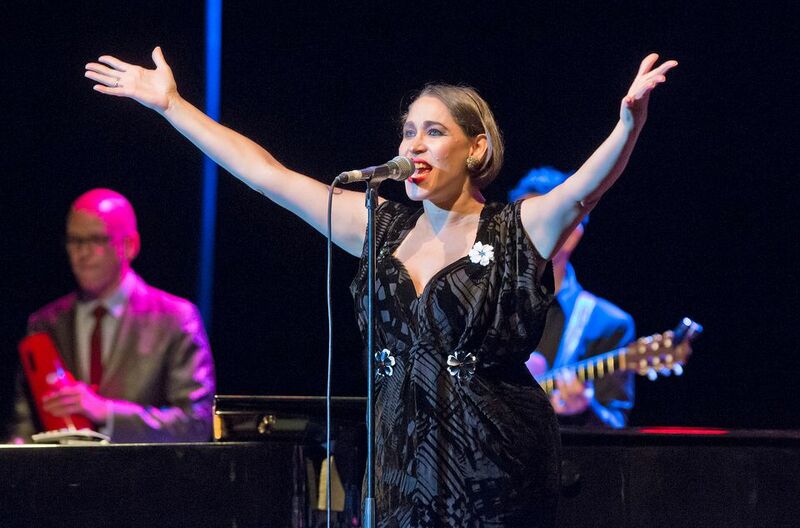 Pink Martini performs at the Montreal Jazz Festival on July 6, 2019, at 7 p.m., at the Maison Symphonique, Place des Arts. Buy tickets. George Benson and his opening act, Kandace Springs will be a highlight of the Jazz Festival. He is an expert improviser and exciting entertainer who is considered one of the greatest guitarists of all time. In the late 1960s, Benson sat in on Miles Davis’ ​Miles in the Sky sessions and also is known for his arrangements of Beatle's tunes. Benson has released hits such as Give Me the Night and Turn Your Love Around and On Broadway. George Benson will perform on July 1, 2019, at 7:30 p.m., in the Salle Wilfrid-Pelletier, Place des Arts. Buy tickets. Narcos fans would recognize Rodrigo Amarante's best-known song anywhere, "Tuyo," the Netflix-produced series' theme. Not that it's his first song. The "up-and-coming" Rio de Janeiro Bossa Nova indie rocker has been playing in bands and co-writing songs for over 15 years. He is currently recording his second solo album, due to be released in early 2019. Rodrigo Amarante performs at the Montreal Jazz Festival on June 27, 2019, at Le Club Heineken in collaboration with the Stingray musique series. Buy tickets. Alexandra Stréliski is a neo-classical pianist and composer. She made a name for herself when she released her first album, Pianoscope. Her Prélude song was played in the movie Dallas Buyers Club, by Jean-Marc Vallée. With an already sold-out concert at the Théâtre Outremont in February 2019, she is quite the sought-after jazz musician. Stréliski performs at the Montreal Jazz Festival on July 4, 2019, at 8 p.m. at Théâtre Maisonneuve, Place des Arts. Buy tickets. ,Dianne Reeves, jazz singer, is one of the all-time greats. Other jazz greats such as Gregory Porter, Robert Glasper, Lalah Hathaway, and Esperanza Spalding are among the line-up of guest artists on her latest album, Beautiful Life. Her performances at the Montreal Jazz Festival are always highly anticipated and popular. Reeves performs at the Montreal Jazz Festival on July 1, 2019, at 8 p.m. at Théâtre Maisonneuve, Place des Arts. Buy tickets. Some of the best gigs at the Montreal Jazz Festival are free. Incidentally, most of its line-up is. Out of over 500 scheduled concerts, 350 don't cost a dime.